Browsing through various angling magazines of the past few years, one can only wonder how a water stretch of such importance could be neglected for so long. Enough now! Credit where credit is due. 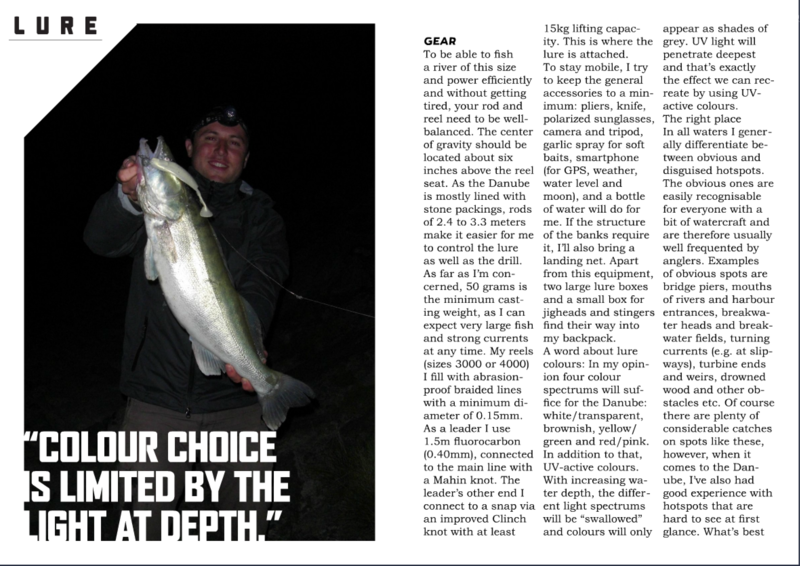 With this article I want to provide you with the necessary tools to successfully fish for zander in the Danube. 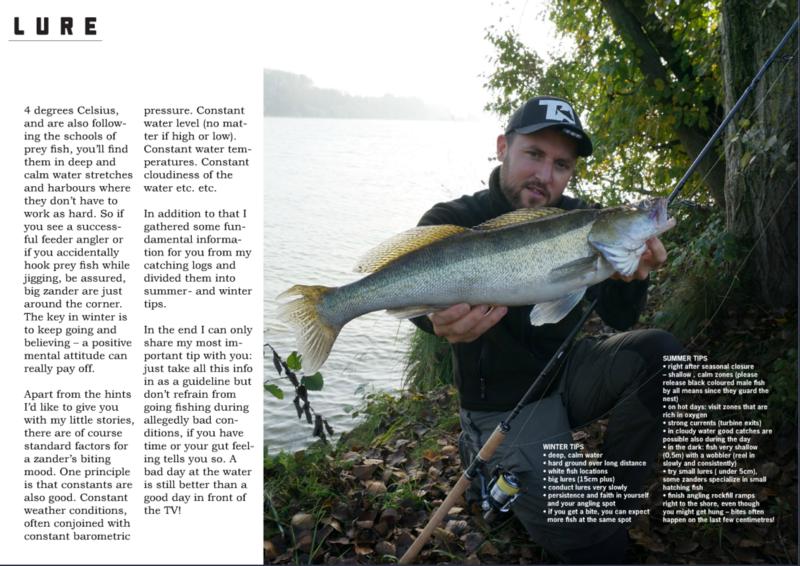 Of course you can always adapt methods and tactics from journalistically spoilt rivers like the Elbe. But if you want to specialize, you’ll need to go one step further. Every river holds its own secrets – and so does the Danube. To be able to fish efficiently and without getting tired, rod and reel need to be well-balanced. The center of gravity should be located about six inches above the reel seat. As the Danube is mostly lined with stone packings, rods of 2,4 to 3,3 meters make it easier for me to control the lure as well as the drill. As far as I’m concerned, 50 grams are the minimum casting weight, as I can expect very large fish and strong currents at any time. My reels (sizes 3000 to 4000) I fill with abrasion-proof braided lines with a minimum diameter of 0,15mm. As a leader I use 1,5m fluorocarbon (0,40mm), connected to the main line with a Mahin knot. The leader’s other end I connect to a snap via an improved Clinch knot with at least 15kg lifting capacity. This is where the lure is attached. To stay mobile, I try to keep the general accessories to a minimum: Pliers, knife, polarized sunglasses, camera and tripod, garlic spray for soft baits, smartphone (for GPS, weather, water level and moon), and a bottle of water will do for me. If the structure of the banks require it, I bring a landing net. Apart from this equipment, two large lure boxes and a small box for jigheads and stingers find their way into my backpack. A word about lure colours: In my opinion four colour spectrums will suffice for the Danube: white/transparent, brownish, yellow/green and red/pink. In addition to that, UV-active colours. With increasing water depth, the different light spectrums will be “swallowed” and colours will only appear as shades of grey. UV light will penetrate deepest and that’s exactly the effect we can recreate by using uv-active colours. Find more information about gear in the tacklebox. In all waters I generally differenciate between obvious and disguised hotspots. The obvious ones are easily recognisable for everyone and therefor usually well frequented by anglers. Examples for obvious spots are bridge piers, mouths of rivers and harbour entrances, breakwater heads and breakwater fields, turning currents (e.g. at slipways), flushed out outside curves, turbine ends and weirs, drowned wood and other obstacles. 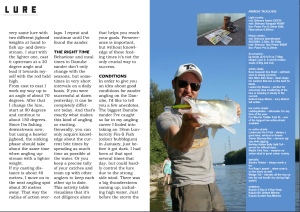 Of course there are plenty of considerable catches on spots like these, but especially when it comes to the Danube, I’ve had good experience with hotspots that are hard to see at first glance. What’s best about it is that I almost own these spots… but what exactly defines these spots and how can you detect them? It’s all about the underwater zone: holes, mountains, edges, channels, obstacles, gravel banks, structured and hard ground. Apart from sonar, there are two ways to find these places: On one hand, turbulences on the water surface help you to determine the ground’s condition. The second – and more secure – way is to fish the potential angling spot in a fan-shaped way. Thus, with a little practise, you can feel hardness and material of the ground with every touchdown of the jighead. The right way to hold the rod (index finger on the blank) will make it easier for you. To test the ground conditions you can also just drag the jighead along. If you feel a continuous rattling, you found your hotspot – a gravel bank! If you get lots of hangers, that’s a good sight as well, since that indicates structured ground and/or underwater obstacles. The general water depth and deepenings as well as elevated spots are measurable and can be detected by paying attention to the duration of the lure sinking, while keeping the number of reel rotations steady when lifting the lure. If you intend to fish a longer river stretch bit by bit, you have to make sure you don’t leave any gaps. I always have the very same lure with two different jighead weights at hand to fish up- and downstream. I start with the lighter one, cast it upstream at a 20 degree angle and lead it towards myself with the rod held high. From cast to cast I work my way up to an angle of about 70 degrees. After that I change the lure, start at 80 degrees and continue to about 150 degrees. Since I fish downstream now, but use a heavier jighead, the sinking phase should take about the same time as at angling upstream with light weight. If my casting distance is about 40 metres, I move on to the next angling spot about 30 metres away. That way the radius of action overlaps. I repeat and continue until I’ve found the zanders. Behaviour and mealtimes in Danube zanders don’t only change with the seasons, but sometimes in very short intervals up to daily. If you were successful at dawn yesterday, it can be completely different today. And that’s exactly what makes that kind of angling so exciting! Generally, you can only acquire knowledge about the current biting times by spending as much time as possible at the water. Or you keep a precise tally of your catches and team up with other anglers to keep each other up to date. This activity table visualizes that it’s not diligence alone that helps you reach your goals. Perseverance is important, but without knowledge about the feeding times it’s not the only crucial way to success. 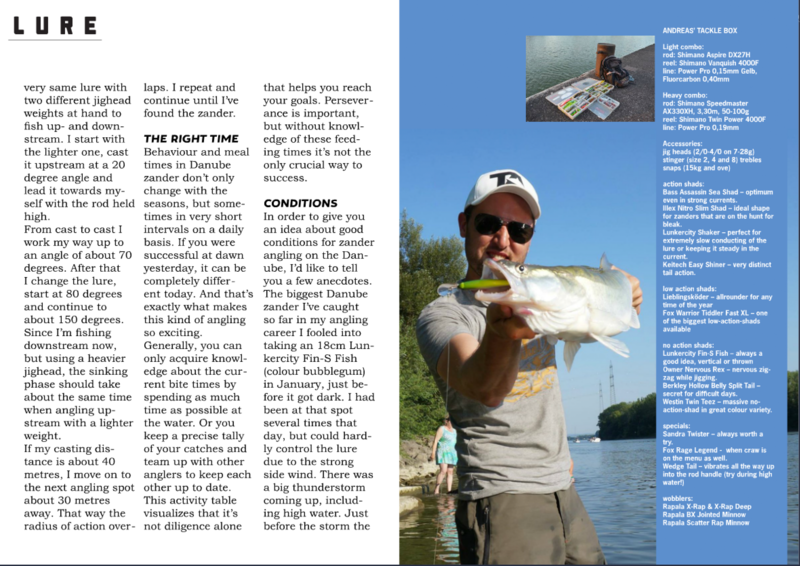 In order to give you an idea about good conditions for zander angling on the Danube, I’d like to tell you a few anecdotes. The biggest Danube zander so far in my angling career I could trick into biting into my 18cm long Lunkercity Fin-S Fish (colour bubblegum) in January, right before it got dark. I had been at that spot several times that day, but could hardly control the lure due to the strong side wind. There was a big thunderstorm coming up, including high water. Just before the storm the weather got calmer. I immediately drove to my spot behind the bridge pillar and was able to land the fish after only a few casts and a tough drill. If there’s a flooding coming up (any time of the year), get your stuff and go fishing! Here you can observe the water levels at all Danube powerplants: www.land-oberoesterreich.gv.at (Themen/Umwelt and Natur/Wasser). With time, you’ll get a feeling for how long it takes the high water to arrive at your angling turf. 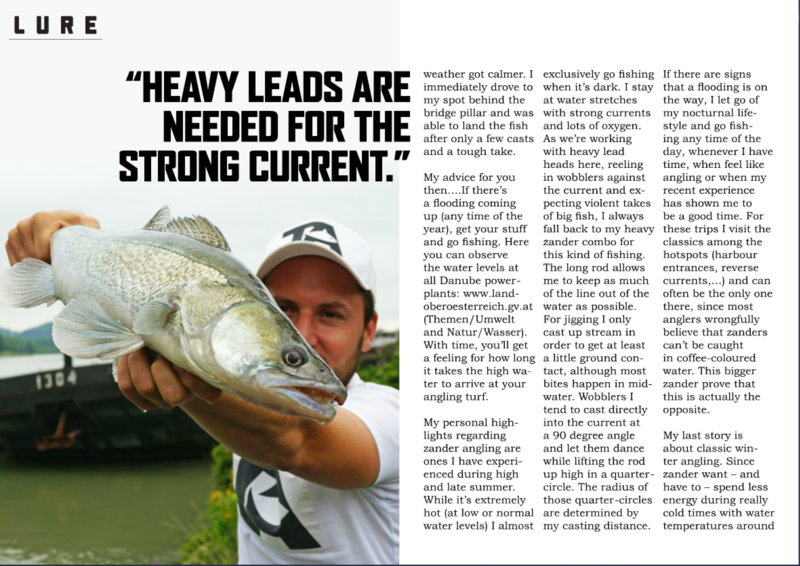 My personal highlights regarding zander angling I experienced during high and late summer. While it is extremely hot (at low or normal water levels) I almost exclusively go fishing when it’s dark. I stay at water stretches with strong currents and lots of oxygen. This and many other big zanders I could catch at the turbine exits of water powerplants. I promise you: if you ever drilled a stream zander, you’ll never want it any other way! As we’re working with heavy lead heads here, reeling in wobblers against the current and expecting violent drills of big fish, I always fall back to my heavy zander combo for cases like these (see the tacklebox). The long rod allows me to keep as much of the line out of the water as possible. For jigging I only cast upwards the stream in order to get at least a little ground contact. Most bites happen in middle waters, though. Wobblers I tend to cast directly into the current at a 90 degree angle and let them dance while lifting the rod up high in a quarter-circle. The radius of those quarter-circles are determined by my casting distance. If signs are that a flooding is on the way, I let go of my bat-like lifestyle and go fishing any time of the day, whenever I have time, feel like angling and my recent experience has shown me to be a good time. Now I visit the classics among the hotspots (harbour entrances, reverse currents,…) and am even alone there sometimes, since most anglers wrongfully believe that zanders can’t be cought in coffee-coloured water. 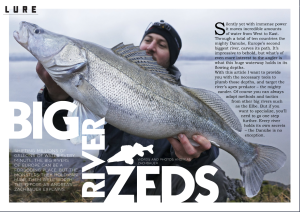 This big zander proves the opposite! On several consecutive days I could always catch good fish in the early afternoon. This one was the crowning of several short sessions at the same time at the same spot. 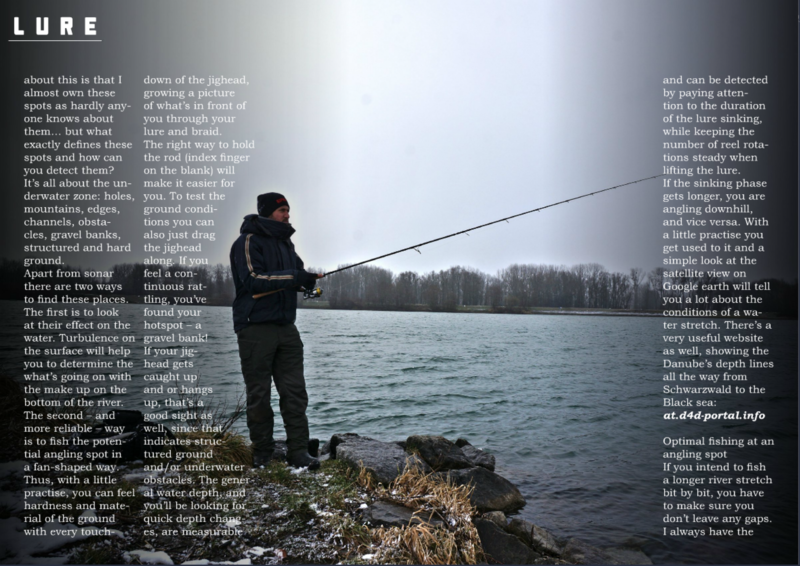 My last story is about classic winter angling. Since zanders want – and have to – spend less energy during really cold times with water temperatures around 4 degrees Celsius, and are also following the white fish schools, you will find them in deep and calm water stretches and harbours now. 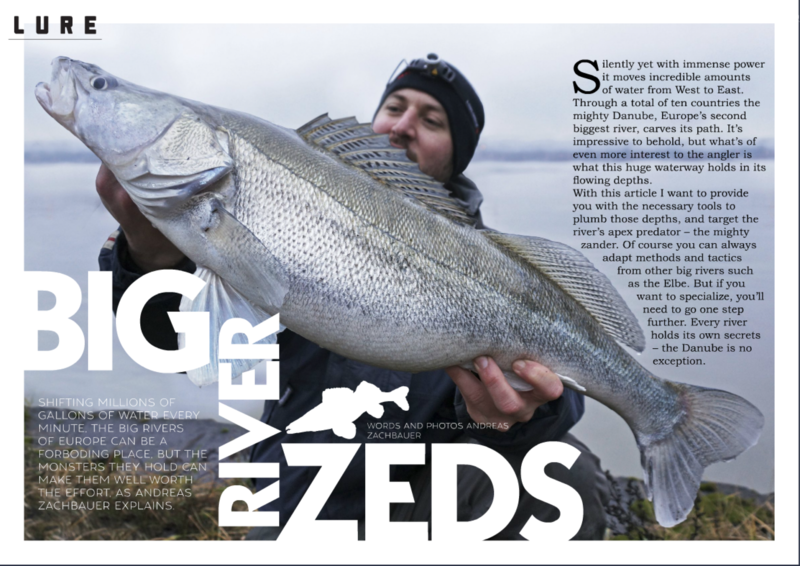 So if you see a successful feeder angler or if you accidentally hook white fish while jigging, be assured: big zanders are around the corner! This bombshell was caught during exactly those circumstances, after several hours of futile angling at temperatures below freezing point. Biting times during the winter often last only a few minutes – if you don’t have faith in yourself then, you’re lost. Apart from the hints I’d like to give you with my little stories, there are of course standard factors for a zander’s biting mood. One principle is: anything that is constant, is also good. Constant weather conditions, often conjoined with constant barometric pressure. Constant water level (no matter if high or low). Constant water temperatures. Constant cloudiness of the water. In addition to that I gathered some fundamental information for you from my catching logs and divided them into summer- and winter tips. • finish angling rockfill ramps right to the shore, even though you might get hung – bites often happen on the last few centimetres! In the end I can only share my most important tip with you: just take all this info in as a guideline but don’t refrain from going fishing during allegedly bad conditions, if you have time or your gut feeling tells you so. A bad day at the water is still better than a good day in front of the TV! Bass Assassin Sea Shad – optimum even in strong currents. Illex Nitro Slim Shad – ideal shape for zanders that are on the hunt for bleak. Lunkercity Shaker – perfect for extremely slow conducting of the lure or keeping it steady in the current. Keitech Easy Shiner – very distinct tail action. Owner Nervous Rex – nervous zig-zag while jigging. Berkley Hollow Belly Split Tail – secret for difficult days. Westin Twin Teez – massive no-action-shad in great colour variety. Sandra Twister – always worth a try. Fox Rage Legend – when craw is on the menu as well.